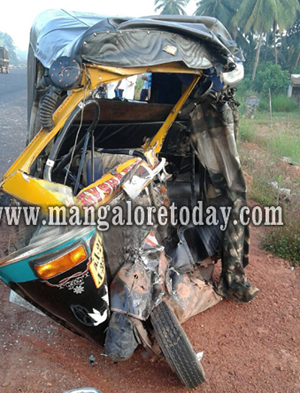 Mangaluru, Nov 6, 2015 : An autorickshaw driver lost his life in a head-on collision between his autorickshaw and a fish laden lorry at Uchilagudde on the NH 66 in Ullal on November 6, Friday. The deceased is Mohammad Rafique (45), a resident of KC Road, Talapady. Rafique was heading towards Someshwar from KC Road when the mishap took place. Rafique used to park his vehicle near the Someshwar Railway Station and was on Friday heading towards his parking spot at around 4.30 when tragedy struck. The lorry was proceeding towards Kerala from Mangaluru. The deceased Rafique has left behind his wife, three daughters and a son. A case has been registered by Ullal police.